Fall is fast approaching. Football season is here. Frolicking with loved ones in the crisp September air is a must. Anyone who knows me will tell you that I don't know a thing about football. Nor do I care to learn the ins and outs of what's happening on that field. It seems complicated to me. First downs, second downs, touchdowns. Typically you'll find me cheering for the boys who are falling behind while commenting on who I think is going to break down in tears back in the locker room. Despite my atypical approach to viewing major league sports (is that the proper way to refer to professional football or do you only say 'major league' when talking about baseball? ), I can't deny my enjoyment of the tailgate party. The burgers, the beer, the bean bag lawn games, kids running around like wild. So much fun for the whole family. Tomorrow afternoon we're headed to the home-field opener for our local college team (is that the proper way to refer to the first home game? ), not because we have tickets to the game but because friends are gathering to partake in this glorious fall tradition. I look forward to the burgers, the bean bag lawn games and the wild children, but being gluten-free means that I won't be able to enjoy the most important "b" in this equation—the beer. 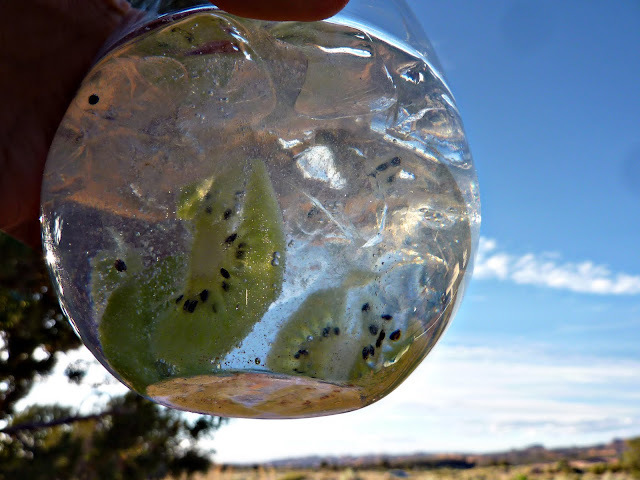 In lieu of my favorite six-pack of bubbly brew I'll be bringing my favorite souped-up cocktail—the not-so-famous Gin and Tonic with a Twist of Kiwi and Lime. Mix it all together. Join me in the enjoyment of this atypical tailgating cocktail!